Meanwhile, the Iranian Foreign Ministry summoned the new French ambassador to Tehran, Philippe Thiebaud, and handed him a protest note. Araud had referred to a flaw in the nuclear agreement with Tehran also called the Joint Comprehensive Plan of Action (JCPOA) which was long known to U.S. Officials. A key question by critics about the JCPOA is about what happens to Iran’s right to enrichment after the JCPOA expires. Based on the Sunset Clause in the deal, some of the nuclear limitations imposed on Iran based on the agreement will terminate between 2023 and 2025, when Iran can increase the number of its centrifuges. One of the issues left unclear by the Sunset Clause is if Iran will be allowed to enrich uranium beyond the degree needed for a civilian nuclear program, or it can go higher, getting closer to bomb material. Iran has also accepted other limitations up to 2040, but critics say the limitations that end by 2025 will bring the situation back to its starting point. That means JCPOA has not slowed down Iran’s nuclear program. 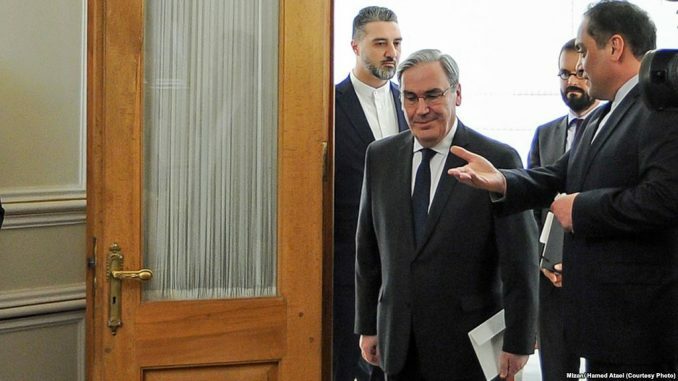 What has angered Tehran is that the French ambassador to the United States has said Iran should be closely monitored by international organizations and should prove that its nuclear program is not a military one. “It would be a mistake to assume that Iran would be allowed to enrich Uranium when the JCPOA terminates,” he said. This means that if Iran fails to prove its nuclear program is civilian, its nuclear activity will be “illegal”. All of these are in fact demands for “a complementary agreement” that would force the Islamic Republic to enter negotiations over permanent limitations about its nuclear program. On May 8 2018, when the U.S. pulled out of JCPOA, Senator Bob Corker also said that the future of JCPOA depends on U.S. and U.K.’s agreement regarding the Sunset Clause. This is also what Secretary of State Mike Pompeo mentioned as the second of his 12 conditions for an agreement with Iran, voicing concern about Iran’s ability to quickly begin to make a nuclear bomb and start an arms race. One could say that the failure of initial efforts to deal with the Sunset Clause was what prompted the United States to pull out of JCPOA. Many analysts believe that Iran is following the policy of “strategic patience” while waiting and hoping for president Trump’s presidency to come to an end in 2020. Iran will not leave the JCPOA at least until then, as it is waiting for another president at the White House who might return to the JCPOA. According to the New York Times, this is what European diplomats have suggested to Iran. But will a new President, if there is one, behave differently regarding the Sunset Clause? Based on the history of tensions between Iran and the United States, no matter who is the President in America, making matters clear about Iran’s right to enrichment will still remain an option on the table. Even if Iran’s strategy is going to pay off, Iran will have to discuss in three year’s time, what Europeans, particularly the French demand now. But Iran and its leader do not like to start such a negotiation, at least while Trump is in office. The same deadlock also occurred in 2004 when Khamenei called a long term suspension of enrichment out of the question and a “colonial idea”. So he decided to have so many centrifuges that would give him the upper hand in any negotiation with the West. In 2014, Iran agreed to keep only 6104 of its 19,000 centrifuges. In other words, Iran forgot about a 10-year investment on its nuclear program in order to have some of the sanctions lifted. This is oddly what Iranian officials refer to as a win-win deal: Spending national wealth on a costly and ambiguous nuclear program, and then waste your achievements to save yourself from stifling sanctions. The long standing tensions between Iran and France over the details of Tehran’s nuclear program has reached a new height as the nuclear program that was supposed to be the key to the Islamic Republic’s power has turned into its Achilles’ heel.